The bed and pillows were insanely comfortable. The continental breakfast included biscuits and gravy, eggs, danishes, waffles, and more. Very yummy. It was nice and quiet, we were not disturbed. Service/Staff very friendly. Ans breakfast was good. The pool was nice and the staff was friendly and helpful. Very nice and comfortable. Very accommodating to folks with pets but great for people to! I would definitely stay again. The beds were comfortable, pillows were nice and the bathroom looked updated. Good, convenient place to stay if you happen to be in the area. The pool was clean, so was the room. We also used one of the two indoor hot-tubs which was nice after the long drive. Our cooler was filled up with ice by the friendly front desk person when we left. All in all we enjoyed the stay more then we thought we would. 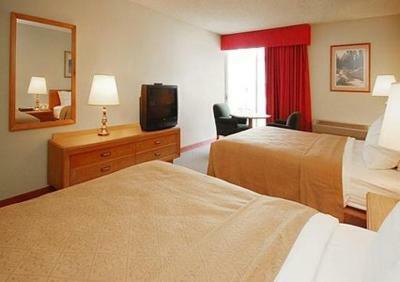 Quality Inn & Suites Canon City This rating is a reflection of how the property compares to the industry standard when it comes to price, facilities and services available. It's based on a self-evaluation by the property. Use this rating to help choose your stay! 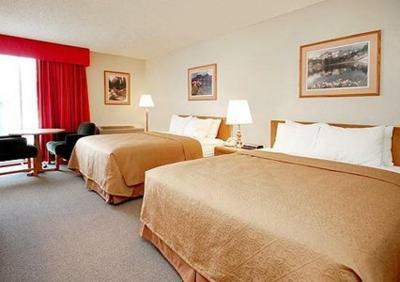 The pet-friendly Cañon City, CO Quality Inn & Suites hotel is near Arkansas River, which offers Raft Masters whitewater rafting and adventure outfitters. The hotel's restaurant and cocktail lounge is open for dinner and offers evening room service. 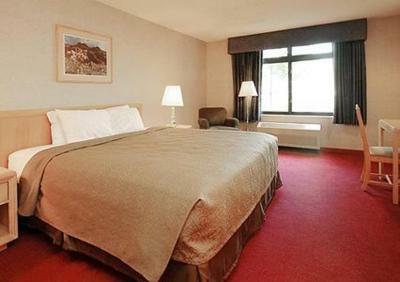 The hotel is located minutes from Royal Gorge Bridge and Park, world's highest suspension bridge, 1,53 feet above the Arkansas River, Royal Gorge Route Railroad, Dinosaur Depot, Museum of Colorado Prisons and Fremont Center for the Arts. Our amenities include free high-speed Internet access, free breakfast, free local calls, an outdoor heated pool and indoor hot tub. Read a free weekday newspaper, while sipping free coffee on our lounging courtyard patio. All our rooms have coffee makers, hairdryers, irons and ironing boards. Some rooms have refrigerators and microwaves. Nonsmoking rooms are available. Copy and fax machines are available and our meeting space accommodates up to 250 people. Laundry facilities are onsite. 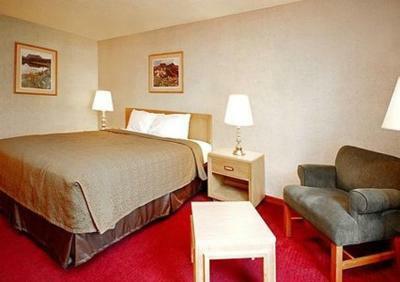 When would you like to stay at Quality Inn & Suites Canon City? House Rules Quality Inn & Suites Canon City takes special requests – add in the next step! Quality Inn &amp; Suites Canon City accepts these cards and reserves the right to temporarily hold an amount prior to arrival. Quality Inn & Suites Canon City accepts these cards and reserves the right to temporarily hold an amount prior to arrival. The friendly staff and great restaurant! Excellent staff. Ready to meet your needs. Pool temp to cold. Hotel could use new tub, toilet seat(broken), new carpet ( very worn). No microwave in room. Dining tables and carpet was very sticky. People in next room noisy. Smoking, yelling, eating food and throwing it in front of my patio door. Was run down and needed fixed. When I walked in to check in the person at the front desk was barely visable behind her computer. She didn't get up and greet me just asked if she could help me. I did get checked in and was given the bare essential information with little or no welcoming. The rooms are somewhat outdated and in desperate need of new carpet. We went to open the curtains and our patio door opened into a dining room, closed that immediately. The outlet near the sink in the bathroom was hanging half out of the wall, when I used the blow dryer that evening it sparked and cut off. The next morning at 6:30 when leaving I stopped by the desk to report and request a new blow dryer and was told it would be taken care of. That evening I had the same experience and they sent the maintenance man to the room and he wanted to know what the problem was, he was there that morning and the dryer was fine with a very curt attitude that implemented the problem was me not the dryer so I had to play show and tell. He replaced it and when using that one the fan fell apart and sparks and pieces we're flying out so my husband took it to the desk and asked for another. Needless to say the same unhappy man was sent to replace it. Third dryer was finally the charm. The shower curtain rod was hanging on by a thread so there curtain slipped to the center and wouldn't stay closed so water went all over when showering. The pictures I'm attaching are all from the room. This is a seedy old place that needs renovation. Reeked of cigarette smoke (non-smoking), filthy carpet, stained bathroom fixtures and worn out bedding. On the main road with easy access. Bed was hard to sleep on. Hotel needs some work. Carpet is in bad shape. Some doors have gaps, not secure. Things look in disrepair. Someone knocked on door around 4-4:30 am. It even sounded like the door was trying to be opened. And knocked again. It was not a quiet knock. Went to door and saw female (staff) walk away. Found a receipt for hotel stay in door. Very alarming to have this happen at that hour. Why is someone knocking on the door at this hour to deliver the hotel statement?